On June 6, 2015, the Griffin Choral Arts Board of Directors adopted the following Code of Conduct to protect all those involved in our organization and to ensure a safe, professional environment at all of our rehearsals, concerts, and other events. As singing Members of Griffin Choral Arts, each of us plays a vital role in ensuring that we create and maintain a community that allows for this kind of positive interaction, whether within our own ranks, or between ourselves and the greater community. To this end, we are all expected to exhibit behavior that is consistent with both our mission and the values spelled out in this Code of Conduct document. The following guidelines detail specific expectations regarding our interactions with each other and within the community. 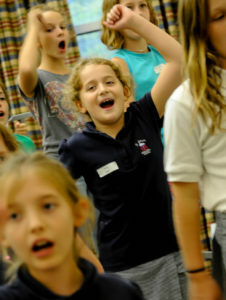 Griffin Choral Arts routinely engages in a wide range of activities where Members interface with the public. These may include not only our performances, but also activities like PR appearances, fundraisers, tours, retreats, social events, and other situations that bring us into contact with people outside the organization. These interactions may be face-to-face, or be conducted as distance communications such as phone calls, emails, social media, etc. When representing GCA at public events and performances, Members are expected to conduct themselves in a professional and congenial manner on- or off-stage. To the extent that they might be seen as representing GCA in other types of public interaction, Members are asked to conduct themselves with a healthy respect for the impact their actions may have on GCA’s reputation and standing in the community. Communications via email are held to the same standard of respect and consideration as any form of Member interaction. Communications between Members concerning personal matters should be made directly between the individuals involved, rather than through rumor or innuendo. Out of respect for people’s privacy, Members are asked to refrain from contacting other Members at their place of business unless they have received prior permission to do so. If, at any time, a Member of the GCA community feels threatened, harassed, sexually harassed or otherwise intimidated by another, and feels that he or she is unable to work out the situation privately, that person is urged to immediately contact the Artistic Director. If the Artistic Director is the alleged harasser, the issue may be addressed to the Assistant Conductor or directly to the Board President. Confidentiality will be respected and maintained as much as possible to resolve the incident. If a satisfactory resolution cannot be worked out with this initial contact, the reporting Member may escalate the discussion to the Board President. Griffin Choral Arts strives to be an open and non-judgmental community in which the ability to participate is based solely on one’s skills, abilities, and commitment. Occasionally, this value comes into tension with the duty of the Chorus to protect our Members, audiences, and the Chorus’ reputation from harm. It is GCA’s position that it is the job of the civic authorities, not GCA’s, to pass judgment concerning individual Members who run afoul of civic laws. Accordingly, we leave it to the authorities to decide who is guilty and who is not, who deserves punishment, and at what point an offender’s debt to society has been paid. Our willingness to allow individuals with criminal records to participate as Members is thus guided by the presumed wisdom of the legal system. Members with criminal backgrounds who have successfully discharged their obligations as offenders, and whose activities and movements are not limited by the courts, will not have their Chorus activities restricted solely by virtue of their past history. Members whose activities are prescribed in some manner are required to bring such limitations to the immediate attention of the Artistic Director, who will determine whether participation will be possible, and under what terms. Members with past criminal backgrounds who do participate within the organization should bear in mind that their behavior and activities will be subject to ongoing scrutiny. Should a Member be named as a suspect, placed under arrest, and/or arraigned for a felony while a Member of the Chorus, that Member’s Membership will be suspended pending resolution of the case. Finally, when a Member’s history or activities in the community have earned them such a degree of notoriety that their continuing participation would, in the opinion of the Artistic Director, severely harm the organization’s reputation, that individual’s Membership may be refused or terminated regardless of their present good behavior. The Chorus is an ensemble, and individuals behaving erratically due to substance abuse harm the communal creative process and distract from the performance. Substance abuse also exposes GCA to liability in terms of insurance coverage, the ability to utilize venues, etc., and cannot be tolerated. Members found to be using alcohol or illegal drugs during Chorus activities, with the exception of sanctioned social events featuring alcohol, will be asked to leave the premises on that occasion. Members thought to be functioning sub-par at Chorus events due to the influence of alcohol or other drugs consumed off-site (including prescription medication), will also be asked to leave the specific rehearsal or performance. While individual incidents will be handled as above, on-going impairment at Chorus activities will be addressed by the Artistic Director, the Assistant Conductor, and the Member’s Section Leader. In order to preserve an atmosphere of mutual respect and enjoyment, every Member is expected to conduct him or herself in a professional and considerate manner whenever rehearsals are in progress. Members are expected to show basic courtesy and respect to both artistic and staff members, whether in rehearsal or performance situations. Excessive talking – or any other disruptive or “attention getting” behavior – is strongly discouraged. It not only distracts the person at the podium but also interferes with other Members’ learning process and concentration. Babies/kids/pets: Young children should not be brought to rehearsal. A nursery is provided for our regular rehearsals. Service animals are allowed when necessary. Members are encouraged to discuss their concerns about any disruptive behavior directly with the individuals who are being disruptive. If this proves ineffective – or if the Member is not comfortable doing this – he/she should talk to the Section Leader, Assistant Conductor, or the Artistic Director. In the event of a disagreement within the panel, a majority vote shall determine the outcome of the decision. Members may appeal in writing the decision of the Panel to the Board President within ten calendar days of notification. The Board President can take action as appropriate to support the disciplinary action taken or overturn it. I agree to abide by the Griffin Choral Arts CODE OF CONDUCT outlined above.